Seaweed provides the body with an array of health benefits due to its content of essential minerals, according to The Best of Raw Food online. Seaweed is often considered an “ancient super food” and was used throughout history to promote health and longevity. Seaweed is available in supplement form when food form is not available, but one way to obtain the health benefits of seaweed is in a seaweed salad. Consult a nutritionist for complete information about seaweed. People have been eating seaweed for years to obtain the optimum nutrition that it provides. According to the Best of Raw Food online, seaweed contains a wealth of minerals, including iodine, calcium, magnesium and iron, as well as vitamins A, B and C, protein, fiber, alpha linoleic acid and more. Seaweed contains more vitamin C than the orange fruit and is one of the richest plant sources of calcium. Eating seaweed salad regularly will also enrich your body with important polysaccharides, which may help to prevent cardiovascular disease and diabetes, as well as improve liver function and stabilize blood sugar levels. The nutritional content of seaweed salad provides your body with a variety of health benefits. The natural iodine in seaweed helps to maintain healthy thyroid function, according to the Best of Raw Food online. Seaweed serves as a natural anti-viral, anti-bacterial and anti-inflammatory agent, which is effective in sustaining optimum health. The vitamin and mineral content of seaweed salad can help improve and maintain the health of your hair, hearing, memory, skin, eyesight and teeth. The additional nutrients may also benefit the health of your immune system, stabilize cholesterol levels, support healthy blood pressure levels and assist in proper digestion. Consult your health care provider for the complete health benefits of seaweed. Seaweed is often eaten in sushi (nori) or can be made into a nutritious salad, according to the Best Raw of Food online. One recipe for seaweed salad includes a raw version that replaces sugar with stevia and rice vinegar with lemon juice. This recipe also calls for nonpasteurized soy sauce called tamari, for added nutritious value. The recipe is made using seaweed, stevia, raw sesame oil, sesame seeds, tamari and lemon juice. The dressing is made by combining stevia, oil, soy and lemon juice. Then, mix the seaweed with the dressing, sprinkle sesame seeds on top and enjoy. Eating seaweed salad may also benefit your fat-fighting ability, as the fiber in seaweed could possibly block more than 75 percent of fat uptake, according to DivineCaroline online. 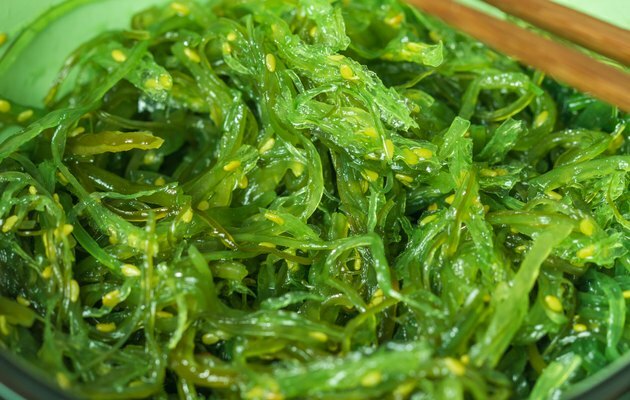 The fiber in seaweed, called alginate, may stop your body from breaking down and absorbing dietary fat. This seaweed fiber may actually block fat more effectively than 60 other types of natural fibers and certain medications. These claims are not medically or scientifically proven, so consult your health care provider for more information about alginate and its effects. Seaweed salad is an effective meal for weight loss, while also providing your body with essential vitamins and minerals. For those who do not enjoy seaweed salad in this recipe’s form, there are also a variety of other ways to eat seaweed salad. According to A 2 Z of Health, Beauty and Fitness online, various health stores and Asian grocery shops sell seaweed in various forms. In dried form, it may be added to raw vegetable salad or crumbled and sprinkled over salad as a seasoning. Dried seaweed strips or sheets may also be eaten as a snack, and seaweed may be eaten together with a fresh, raw vegetable juice. Consult your nutritionist or local grocer for more information about forms of seaweed salad.